It is my sincere wish that this letter finds you and your family in good health. I am writing to you to inform you of a 58-day nation-wide tour I am undertaking in [September and October] of this year. 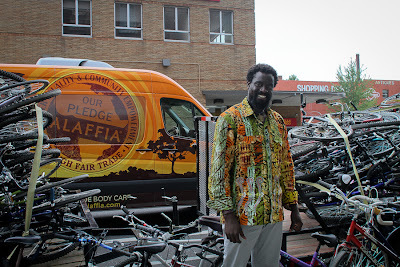 I am packing up a biodiesel van and taking this 8,780 mile tour in celebration of the 10thanniversary of the creation of our Alaffia Shea Butter Cooperative in Togo. Because of a deep commitment and shared will, the cooperative is here today without outside investment. The true reason why we continue to exist is the opportunities each and every one of you has given to Alaffia, and therefore my foremost objective is to visit as many of you as possible as a personal extension of my gratitude. There are no words to express to you the profound impact that your support has enabled Alaffia to have on my communities. [Last December], upon my arrival in Sokodé, more than 4,000 women and children lined up to express their thankfulness. From that moment on, I knew my own life would never be the same. I know now the responsibilities that I must bear for my communities are for life or death, and that this self-sacrifice is justified for the greater good of others. I am greatly looking forward to visiting you and sharing with you our combined achievements as we prepare for the continuing journey towards empowerment of all our communities. I strongly believe that if we march forward together on the long road towards economic justice, we will build on the freedoms for which those before us have sacrificed so that the generations yet to come will realize the fundamental principles of basic equality and full human rights. I humbly thank you and am looking forward to visiting with you. -Our website (www.alaffia.com/tour) will be updated daily. Here you can expect a daily update of the stops that Olowo-n’djo will be making, and if there is a meet and greet near you! -In addition, our twitter feed @AlaffiaSkinCare and Facebook page www.facebook.com/AlaffiaSustainableSkinCare will be full of the daily details of whereabouts and happenings. Olowo-n'djo and the Empowerment Tour van will be on the road starting September 2nd. I think that useful information from https://homework-writer.com/blog/argumentative-essay-outline will be useful for students. Here you can read a lot about argumentative essay writing. This tour was great for you, right? I think you will love process essay service. Don't forget to try it.